On July 8, the quiet Dureung village at Neungwol-ri, Cheongseong-myeon, Okcheon-gun, Chuncheongbuk-do, where the cry of cicada deepened the shade of trees, became active and lively. 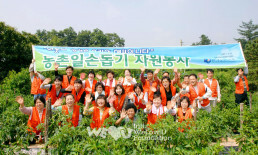 It was because over 20 volunteers from the New Life Welfare Foundation visited there to help the farming of an elderly woman Lee Yeong-ja (63) living alone. She had plowed the wide range of the field (2.4 acres) alone. A month ago, while helping neighboring orchard, she fell off the ladder and injured her arm. From that time on, she was not able to do farming. What the volunteers should do today was to weed the red pepper field and the perilla field, and spray the red pepper with agricultural chemicals. On entering the red pepper field, all were startled; the field that hadn’t been taken care for over a month was filled with weeds taller than the red pepper. We could hardly find the furrows because of the weeds. Even the red pepper trees were bent over by the rain and wind; many red peppers had already dropped. The members wore gloves and began to weed with the hoes they had brought. In the perilla field, too, weeding started. The perilla had light-violet flower buds. The members carefully weeded in order not to hurt the flower buds.